Im Durchschnitt wird dieses Tutorial Your e-commerce platform with Magento 2 at Ubuntu 18.04 mit 5 bewertet, wobei 1.0 die schlechteste und 5.0 die beste Bewertung ist. Es haben insgesamt 37 Besucher eine Bewertung abgegeben. Magento is known as a powerful e-commerce platform written in PHP. This webshop system allows you to set up your own e-commerce and online store in minutes. For an installation under Ubuntu 16.04, our tutorial install Magento on Ubuntu 16.04 can help you. In this tutorial, I’ll show you how to get Magento 2 running on Ubuntu 18.04 LTS. Magento runs on a LAMP stack and is only compatible with PHP 7.0 or 7.1. In addition to PHP, Apache and MySQL are components of the stack. Before we start installing the above components of the LAMP stack, you should do an update/upgrade on your server. With the command shown below you install the Apache2 web server. After this you can use the following command to deactivate the directory list. To stop, start, and enable the Apache2 service, always use the commands listed below to ensure that the server startup occurs. The following is how to create a database server for your webstore. To do this you install MariaDB. After installation, the following commands can always be used to stop, start, and activate the MariaDB service so that the server is started when booting the server. To backup your database server, run the command below to backup the MariaDB server. The command shown above will take you to a user dialog in your terminal. The following block shows Magenta highlighting the answers you should/could give to the neon green highlighted questions/requests and Cyan highlighting the action you need to perform here. After this a restart of the Apache2 webserver is necessary. Now it is time to create a database, as well as a user who can control this database. Log in to MariaDB. as well as the user magentouser, to whom I assign a password (testpassword). Finally, you have to make sure that the user and the database are in relation to each other by assigning the user all rights to the database with the command listed below. PHP 7.1 may not be available in standard Ubuntu repositories. For installation, you must obtain it from third-party repositories. Run the following three commands to add the third-party repository to be upgraded to PHP 7.1. After this you need to install a number of additional modules. To use Magento you must have a user account. You can register for a free account on the Magento website if you don’t already have one. You also need to have a user account to install the software if you want to get the software package from the Magento website to your server. You can download all available software packages from the Magento Tech Resources page. You should then download the Community Edition from the Full Releases section, as shown in the screenshot below. In my example, this is version 2.3.0. Use the download button to download the software package to your local computer. It is also possible to download the latest software package via GitHub. You can do this using the command below, which allows you to change the version number if it has been updated in the meantime. If you have done the previous tutorial, which I provide you with in this tutorial, not from your local server, but from an external scalable server, as we from gridscale offer it, then it is necessary that you transfer the software package to this external server. Just use the command shown below. In my example, I transfer the downloaded package from the download directory of my local server to the root directory of my external server. YourServerIP is the placeholder for the IP of your external server. If you have performed the steps shown above, which bring you closer to your own webshop, on your local server, then ignore the following code snippet. Continue by creating a magento directory under /var/www/html. Unpack the software package and transfer it to the previously created magentodirectory. Modify the directory permissions according to the Apache2 configuration by executing the commands shown below. Create a new configuration file for Magento 2. With the following command I do this with the nano-Editor. This will open an empty content file, in which you can copy and paste the content I provide in the code snippet below. example.com serves as placeholder and you have to exchange it with the domain name of your server everywhere. and also enable the Apache rewrite module. Open your browser and call Magento 2 with the domain name of your server. 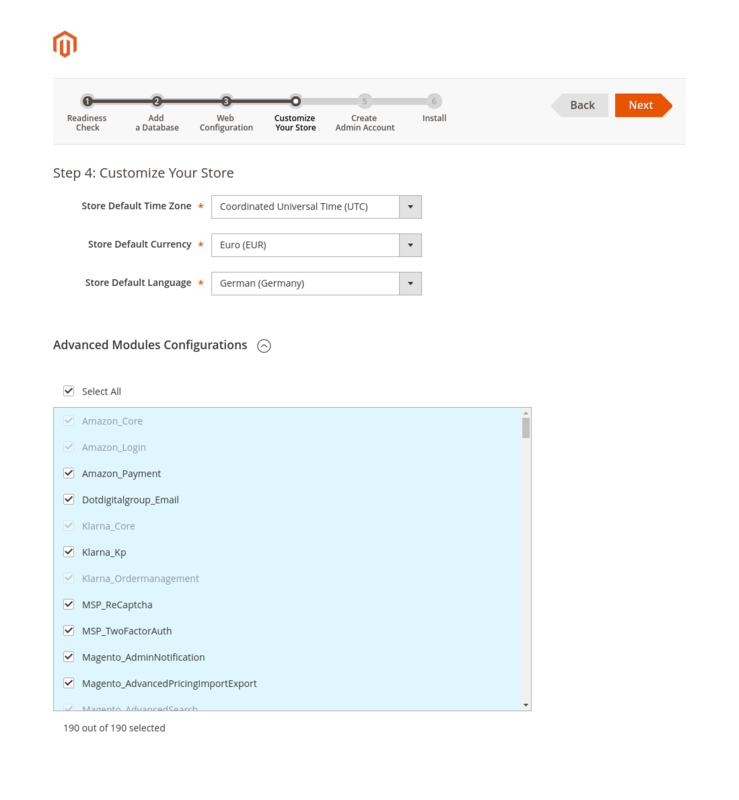 The first time you call up Magento 2, you will see the main page of the setup wizard, which you start by pressing the Agree and Setup Magento button. Then click on the Next button and continue through the setup wizard. After your PHP version and any additional PHP modules required have been successfully checked, you will be taken to form fields where you must enter the data for your database created for using Magento and move to the next setup step with the Next button. Now it’s about the web configuration. Here you have to put your domain name in the field behind https:// . You can also use the Advanced Options options to configure your webstore. Click the Next button to continue with the setup wizard. next you define the time zone, currency and language of your webshop in the form fields of the next step. Again, modulation options for your e-commerce platform are available under the fold-out Advanced Modules Configurations. In the following step you create an admin account for the access to your webshop and confirm the transfer of your data by clicking the Next-Buttons. If you confirmed these entries with the Next button, you will reach the setup wizard page, where you can start the installation with the Install Now button. After pressing the button you are no longer able to change data in the setup wizard via Back-Button. As soon as the installation progress bar has run through, you will be taken to a page where you will find the successful installation, including the URL of your web shop and the login confirmation. Via the Launch Magento Admin button you will be taken to the login page where you can enter and verify your username in combination with your password. If the login is verified, you should see the dashboard of your e-commerce platform.